The Endurance B3R recumbent bike by Body Solid is a light commercial and home model that features self-generating power, near-silent operation, and a lifetime warranty on parts. The console display has 8 LED segments for workout feedback and an 8x30 matrix LED window for profile display. The preset programs include Manual, Interval, Random, Fat Burn, Weight Loss, Heart Rate Control, Rolling, and Cardio. The Endurance B3R recumbent features a 24-lb precision balanced flywheel and a Poly-V belt drive system to provide a super quiet ride with 16 levels of smoothly adjustable magnetic resistance. The solid heavy-gauge welded steel frame has a textured power coat finish and offers a maximum user capacity up to 400 pounds. 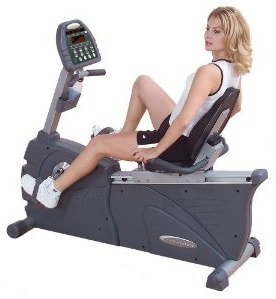 The exercise bike has 14 locking positions for the adjustable seat, and has self-balancing pedals with straps. Both the T-Bar style handlebars at the console and side handlebars have contact heart rate sensors. The recumbent bike’s self-generating electronics means there is no plug-in or cord; the bright display lights up when you begin to pedal. Transport wheels are mounted on the front to move the Endurance B3R to a convenient corner when not in use. The padded DuraFirm contour seat provides comfortable lumbar support allowing you to extend your workouts and get the most out of your cardio conditioning sessions. 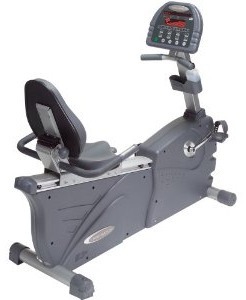 The advanced heart rate control programming, self-generating electronics and superior ride separate the Endurance B3R recumbent bike from other elite home models. In fact, the B3R is rated for commercial use in hotels, spas, health clubs, colleges, rehab clinics and more. Reviewers rank the B3R high when compared with other bikes priced at $1,700, but if you are tempted to pay the full MSRP of $2,495 for this recumbent, check out the Cybex 750R instead.